Janjehli (2150m) is a paradise for hikers and nature lovers. It serves as the base for the Shikari Devi trek, which is further 16 kms up the mountains. Tall deodar trees, apple orchards, lush green meadows, small beautiful streams and enchanting views add to the ethereal beauty of this amazing and quite place. Janjehli offers some of the interesting one-day treks such as Jhanjheli to Karsog, Budah Kaidar, Magru Gaul, Rampur and other adventurous expeditions such as Gadagushaini and Banjar. The Scenic Janjehli valley is a tranquil and calm place. The Beauty of the place is enhanced by its lush surroundings and soothing greenery. The Valley can be used as the base for a Shikari Devi temple. The famous and unique temple of Shikari Devi is about 16 kms from Janjehli. Apart from rest houses, there is a provision of good accommodation facilities at Janjehli. Regarded as Crown of Mandi, Shikari Devi is one of the highest peaks of Mandi District standing at an altitude of 3359 metres. The temple falls near the Karsog Valley and is at a distance of 16 Kms from Janjehli where it is linked by a forest road. 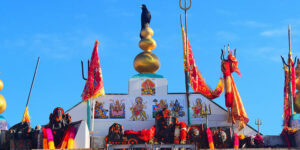 The Shikari Devi temple is devoted to Shikari Devi – Goddess of Hunters who is revered in the form of a stone idol. This temple structure is one of its kinds as it is a open structure with no roof atop. In days long gone, hunters would pray here for victory and a safe hunt. The landscape is beautiful, a heaven for ramblers. 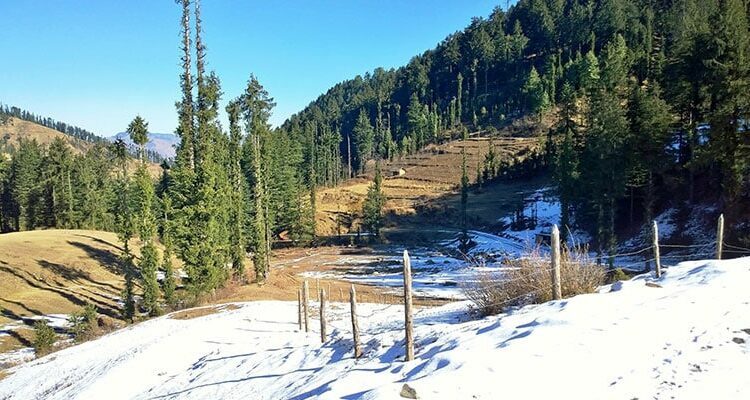 Beautiful pine, deodar woods, and apple orchards can be seen within range. The temple is also surrounded by Shikari Devi wildlife sanctuary recognized by the government of India in 1962. One can spot Goral, Monal, Black Bear, Barking Deer, Musk Deer, Cat Leopard, and The Himalayan Black Bear in the sanctuary. It is believed to be in existence from the time of the Pandavas. According to legends, the Pandavas during their period of exile here were chasing a deer that brought them into the sanctum of Shikari Devi. Sage Markandaya also meditated at this place with a desire to see the worldly form of Goddess Durga (Mahishasur Mardani). An annual fair is held here during Navratri which draws many devotees from near and far off places. According to the myth, there will be no snowfall on the top of Temple. And snow never stays there despite the fact that temple has no roof. 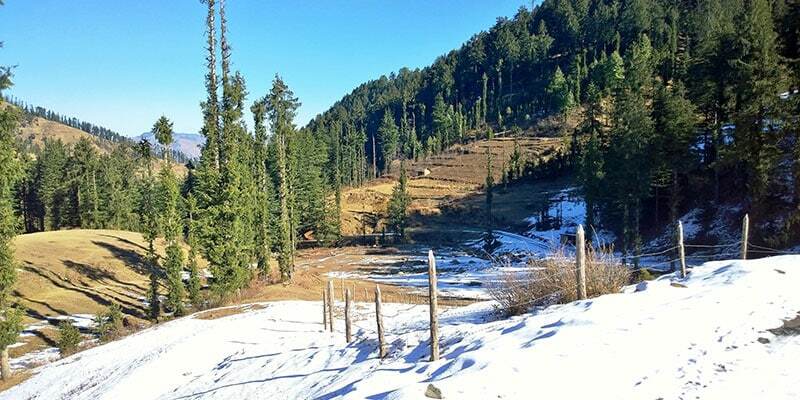 Since the place receives heavy snowfall in winters, so the visit during this time could be perilous. HOW TO REACH: Karsog- Janjehli: 72 kms. Mandi- Janjehli: 95 kms. Janjehli can be visitied in any time of the year. Due to heavey snowfall in winters visiting Shikari Devi temple is not recommended. Only serious trekker should take this trek in winters. 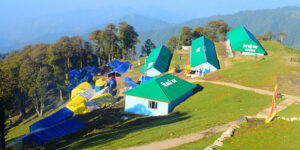 Stay: Tented accomodations are available at Shikari Devi.